(Phys.org)—A team of researchers affiliated with several institutions in the U.S. has found that warming in Alaska has sometimes caused the Kodiak bear to switch to eating elderberries during salmon spawning periods instead of eating salmon. In their paper published in Proceedings of the National Academy of Sciences, the group describes their multi-pronged study of the impact that seasonal changes occurring on the Kodiak Archipelago are having on the bears that live there. The Kodiak Archipelago is a group of islands off the southern coast of Alaska. 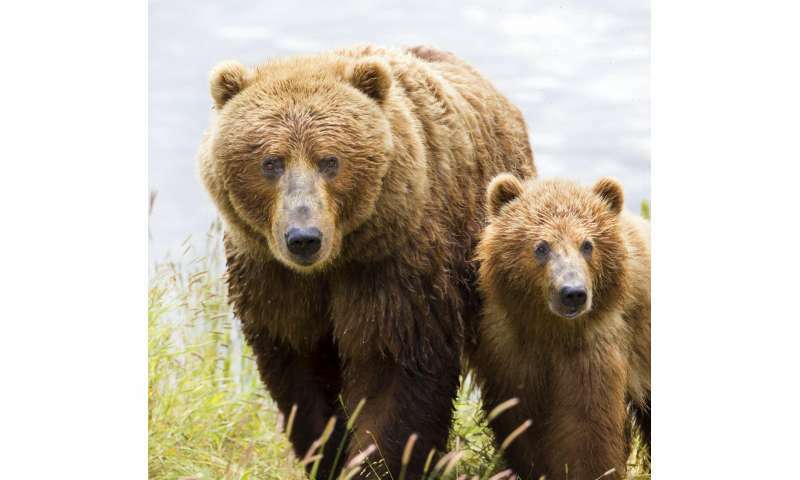 It is home to what are known as Kodiak bears—very large brown bears distantly related to polar bears. The bears have become famous due to pictures of them catching salmon in shallow rivers. The archipelago is also home to elderberries, which are also eaten by Kodiak bears. But the researchers with this new effort have found that the feeding habits of the bears are changing due to a warming climate. To learn more about how the bears are adapting to changing temperatures, the researchers used time-lapse cameras to capture the bears feeding on salmon, placed GPS collars on 36 of the females and then tracked them, conducted aerial surveys and studied bear droppings. The researchers discovered that the bears are increasingly faced with whether to eat salmon or elderberries because the berries are ripening earlier, causing an overlap with salmon spawning. In the past, the researchers note, salmon spawning typically occurred around the end of July each year, while elderberries typically ripened in late August. The bears would wade into shallow rivers and grab the spawning salmon and eat them (or just their eggs) on the shore. Then, a month later, the berries would ripen, and they would start eating those. But over the past few decades, there has been a change—elderberries have begun to ripen earlier, sometimes as early as late July. This means the bears are faced with a choice: continue to feast on the salmon or switch to eating the berries. The decision by the bears is obvious, the team reports—when the berries ripen early, the bears completely abandon the rivers and feast almost exclusively on the elderberries. It is not clear at this time how the switch will impact the bears, the salmon or other creatures that normally feed on fish carcasses abandoned by the bears. Climate change is altering the seasonal timing of life cycle events in organisms across the planet, but the magnitude of change often varies among taxa [Thackeray SJ, et al. (2016) Nature 535:241–245]. This can cause the temporal relationships among species to change, altering the strength of interaction. A large body of work has explored what happens when coevolved species shift out of sync, but virtually no studies have documented the effects of climate-induced synchronization, which could remove temporal barriers between species and create novel interactions. We explored how a predator, the Kodiak brown bear (Ursus arctos middendorffi), responded to asymmetric phenological shifts between its primary trophic resources, sockeye salmon (Oncorhynchus nerka) and red elderberry (Sambucus racemosa). In years with anomalously high spring air temperatures, elderberry fruited several weeks earlier and became available during the period when salmon spawned in tributary streams. Bears departed salmon spawning streams, where they typically kill 25–75% of the salmon [Quinn TP, Cunningham CJ, Wirsing AJ (2016) Oecologia 183:415–429], to forage on berries on adjacent hillsides. This prey switching behavior attenuated an iconic predator–prey interaction and likely altered the many ecological functions that result from bears foraging on salmon [Helfield JM, Naiman RJ (2006) Ecosystems 9:167–180]. We document how climate-induced shifts in resource phenology can alter food webs through a mechanism other than trophic mismatch. The current emphasis on singular consumer-resource interactions fails to capture how climate-altered phenologies reschedule resource availability and alter how energy flows through ecosystems. Shave them and leave them in Keywest Forests. Make sure to go back and shave them periodically. TAKE THEM ALL BACK AFTER 5 years to ALASKA where they belong. The Phys.Org article is a little skimpy. Foundation paper is behind paywall, however, a much fully discussion is at: https://www.carbo...dy-says. Partial data record begins at 1949, it would be interesting to know who/how data was recorded. Carbonbrief article places study location in Kodiak Archipelago. Specific location is in the Karluk basin located is in the Gulf of Alaska rather than Bering Sea. Carbonbrief article does not make the slightest attempt assign any causal effect to GW. a) If there is a correlation to El Nino or all cyclic ocean patterns. b) If this represents a movement the temperature curves to the left or overall higher temperature distribution. Author here. I'm not sure if anyone follows up on their comments, but just in case I will try to answer your questions. Turgent- message me directly and I can send you a preprint of the article. Daily high and low temperatures were recorded at the Kodiak Airport since 1949. Within that timeseries, a few years of daily temperature records were recorded for the Karluk site. We used these paired data to estimate Karluk temperatures from 1949. We did see a statistically significant increase in spring temperatures over this period, but yes, the pacific decadal oscillation may be responsible for some of that increase (air temps in Kodiak seem to be sensitive to the PDO). As for whether the temp curves became earlier (moved left as you put it), or increased in magnitude- that is a great question. I did not investigate this, but will take a look the next time I dig into the climate data. Dingbone- From the lab work we completed it seems like the cyanide compounds are in the seeds, which the bears pass intact through their digestive systems (the plant wouldn't cover their seeds with tasty fruit if the animals it attracted destroyed the seeds in their guts). In an earlier version of the manuscript we attempted to estimate the weight gain on elderberries vs. salmon and found that the bears can probably gain more weight on berries because they have a more optimal amount of protein (see the paper Erlenbach et al. 2014 in the Journal of Mammology). Ultimately we removed this section from the paper because our weight gain estimates required too many assumptions. Regardless, I think it is likely that they are making the decision based on energetics, however, other factors may also be important. For example, bears may also avoid conflicts with other bears by avoiding streams (where bears aggregate). some like coke over pepsi , bears like berries over salmon, who knew ? "The researchers discovered that the bears are increasingly faced with whether to eat salmon or elderberries because the berries are ripening earlier, causing an overlap with salmon spawning." I really wonder just how many of my tax dollars these "researchers" got for this fakeru bunch of bs? I have been to Kodiak and to Raspberry Island several times and know enough about these bears to know that they eat what the hell ever they want when it is available. These fools seem to be suggesting that the critters hold meetings to try to reach a consensus regarding what's for lunch. Maybe these "researchers" next meal ticket will be to see if the salmon runs are getting later the Chilkat River out of Haines, AK & that is affecting the Bald Eagles who congregate there by the thousands to feed on them. I have seen this display several times and is worth seeing. I do not imagine these clown study Polar bears, if they did they would lie and say the species is about finished because of carbon dioxide. The number of bears along the western shore of Hudson Bay, believed to be among the most threatened bear subpopulations, stands at 1,013 and could be even higher, according to the results of an aerial survey released Wednesday by the Government of Nunavut. That's 66 per cent higher than estimates by other researchers who forecasted the numbers would fall to as low as 610 because of warming temperatures that melt ice faster and ruin bears' ability to hunt. The Hudson Bay region, which straddles Nunavut and Manitoba, is critical because it's considered a bellwether for how polar bears are doing elsewhere in the Arctic." This makes one believe that someone is lying and that someone has an agenda and that agenda has always relied on lies to propagate its story line and the truth has never mattered, has it? I have been to Kodiak and to Raspberry Island several times and know enough about these bears to know that they eat what the hell ever they want when it is available. These fools seem to be suggesting that the critters hold meetings to try to reach a consensus regarding what's for lunch. But anyway that is exactly what is happening, the bears really eat whatever the hell they want and can get and they used eat more salmon, now they eat more berries. Why is that? What changed? What could be their "motive". As far as your tax dollars being wasted. You deny science, you refuse to accept its conclusions. So obviously you would perceive it as being wasted, duh again. So you see, although your posts contain little sense they make a lot of it if you read them the right way. Back to bears and their nefarious motives. Could it be they always 'preferred' berries but could not get them? Why not? > None available > Now there is > Why > berries bloom sooner > Why > Seasons have shifted > Why > climate is heating up > Why > Seems mostly because of more C02 > etc. etc. etc. Appreciate the scientific professionalism of "statistically significant" and "required too many assumptions." Glad Grandma's elderberry didn't kill us. I never thought of the Grizzly as an omnivore, and was very surprised to see all of them grazing on the blueberries in Denali. The berries weren't even approaching ripening. "Regardless, I think it is likely that they are making the decision based on energetics, however, other factors may also be important. For example, bears may also avoid conflicts with other bears by avoiding streams (where bears aggregate)." willdeacyosu; since you study these bears, for whatever reasons, you obviously know about this gathering of bears that has been happening for many years. I hope that you do not fall into the trap that lead to Tim Treadwell & his girlfriend getting eaten by bears he thought were his friends at Katmai National Park on October 6, 2003. I'm certain that you have knowledge of the Bear man of Admiralty Island, Allen E. Hasselborg, who also lived with these bears, after guiding hunters to kill them, and he seems to have been more intelligent than what Tim Treadwell was because he died in a hospital in Sitka, AK in 1956. I used to live in Sitka and imagine that he had been in the Pioneer home there before death over took him. I haven't been in The Luck Lady bar in Juneau lately but they use to have a good photo of him hanging on the wall. Ojorf: I would not suggest that you deny science but that you are too involved in ad hominem attacks to ever get any facts. There are many factors that influence the berries as well as the salmon. The earth has been warming at a pace of .8 deg F since the industrial revolution and the end of the Little Ice Age. Late Run Sockeye 467 107,319=2017 & in 2008 it was 28,320. Even you should be able see that there have been large fluctuations in salmon numbers over this time when you alarmist want us to believe that the trace gas, CO₂, is destroying both the brown bears as well as the AK salmon. "So you see, although your posts contain little sense they make a lot of it if you read them the right way.